First-degree heart block: The electrical impulses slow down as they pass through the conduction system, but the signals all eventually and successfully reach the ventricles. First-degree heart block infrequently causes problems or symptoms. Trained athletes may have first-degree heart block. Some medications are known to cause this condition and treatment is generally not needed. Second-degree heart block (Type I): The electrical signals with each heartbeat are delayed further and further until an impulse fails to reach to the ventricles. Sometimes this causes dizziness and/or shortness of breath. Even individuals with a normal conduction system may sometimes have Type I second degree heart block while sleeping. 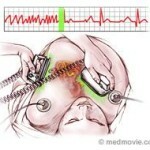 Second-degree heart block (Type II): With Type II, some of the electrical impulses are unable to reach the ventricles. This condition is not as common as Type I, but is more serious. 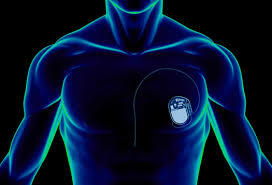 Usually, a cardiologist will recommend a pacemaker to treat type II second degree heart block, because it frequently progresses to third degree heart block. Third-degree heart block: With third degree heart block or complete heart block, no electrical impulses from the atria reach the ventricles. When the ventricles don’t receive electrical impulses from the atria, they may generate some impulses on their own, called ventricular escape beats or junctional beats. Junctional beats are the heart’s naturally occurring backup system but are usually quite slow. Patients frequently feel poorly in complete heart block, with fatigue and lightheadedness. 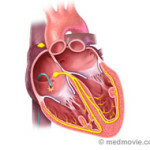 Bundle Branch Block – In bundle branch block, the electrical signals are blocked or slowed as they make their way through the specialized conducting tissue in either of the two ventricles. 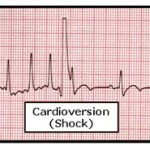 Tachy-brady syndrome – This is where one individual has a slow heart beat when the heart is in normal sinus rhythm and at other times, periods of irregular, fast, heartbeats (supraventricular tachycardias). Medications that are needed to control the fast heart rate can sometimes worsen the already slow heart rate. People with this syndrome can complain of lightheadedness, fainting (syncope) and palpitations. Further, this heart rhythm may also cause chest pain or shortness of breath. Treating this syndrome usually requires a pacemaker implant to prevent the heart from beating too slow and taking medications to prevent the heart from beating too fast. Many medications including heart medications can cause bradycardia. In these cases the benefits and risks of continuing these medications must be carefully evaluated. Unless the causes of bradycardia are temporary or the medications can be changed to alternative ones, the treatment for this is a pacemaker.